You work hard to get ahead and tend your investments like a garden plot. Even if you don't accumulate a fortune, it's yours and you control it – while you are alive, at any rate. You need to make an estate plan to control who gets those hard-earned savings when you die. A will isn't the only legal document that you can use to funnel your estate where you want it to go when you die, but it's the easiest one for many people. 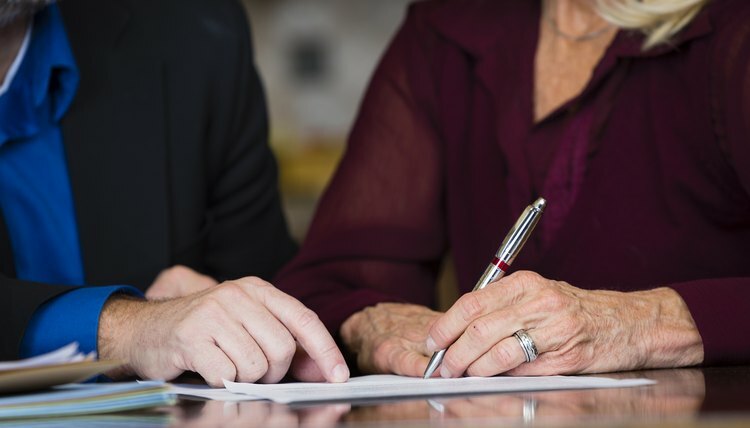 If you don't know anything about wills, a good first step is to get a basic understanding of how the will of a deceased person is handled by the probate court. Wills are legal documents, yes, but that doesn't mean that the intent is difficult to understand or the procedure tedious to follow. In fact, wills are the simplest way a person can identify where she wishes her savings and assets to go when she dies. And, properly prepared, a will not only identifies the beneficiaries, but it also is the vehicle that enables the legal transfer of the property to them. Wills and probate come under state law, not federal law. That means that in order to prepare a valid will, you must follow the dictates of the law in your state. Laws differ dramatically depending on where you live. In some states, oral wills are valid, in others, handwritten wills are valid even without witness signatures. Still other states have laws requiring that one, two or more witnesses watch the person sign her will and then sign after. In some places, you also have to sign before a notary. You can find out the legal requirements for a will in your state by visiting your local probate court or by going to its website. State laws spell out the hoops you have to jump through to make your will enforceable after your death, and if you don't follow them, your will is not valid and intestate laws apply. Lots of people make wills in order to avoid dying intestate, but before you can use that as motivation, you have to understand what it means. If you die without a will and leave assets or property, the state must do something with that property. State laws label dying without a will "dying intestate" and dictate who gets the assets. Although intestacy laws differ between jurisdictions, in all states the property of a person dying without a valid will goes to close family members, starting with a surviving spouse and children. If you die with no spouse or children, your property goes to increasingly distant relatives, like your grandkids, your parents, your siblings and so forth. If there are no relatives at all, the state keeps the money. Intestacy laws recognize that many people want their property to go to family when they die. But not everybody has the same family and not everybody has the same intentions. If your wishes line up with your state's intestacy laws, you have little to risk by dying without a will. But it's okay if they don't. In this country, you are not obliged to leave your property to family. You can leave it to a friend, an employee or a favorite nonprofit. But only with a valid will. The steps you must take to prepare a valid will in your state are called the execution requirements. These vary between states. But certain basic requirements are pretty constant everywhere. First, you must be of age to make a will. In many states, that means you must no longer be a minor. If a minor dies, his property usually becomes the property of his parents. If you are under 18 years old, you may still be able to make a will if you are living as an adult and have been legally emancipated. For example, if you are 17 years old but have married or joined the military, you are legally emancipated and capable of making a valid will. Some states have older and some younger age limits so if you are a young person, check on this before you act. You also must be "of sound mind." This doesn't require that you be Einstein, just that you have a basic understanding of what you are doing. You must know that the document you are signing is a will, that it specifies who will get your property when you die, and the general nature and extent of your property. You must also understand that you are married, if you are, and understand "the natural objects of your bounty," meaning your kids or other family member who might ordinarily think that they will share in your estate. The will must name one or more persons or parties who will get your property. It must suggest that you want the legal document to dispose of your property, i.e., that you intended to make a last will by signing the document. Finally, the person making the will must sign it voluntarily. She usually signs it herself, but she can, if need be, direct a lawyer or one of the witnesses to sign instead of her. If you want to sign this way, check with a lawyer first to make sure you do this right. And, be sure to follow state requirements for witnesses. In almost all states, the signing of a formal will must be witnessed by at least two adults, three in a few states, three plus a notary in Puerto Rico. The adults must know they are witnessing the signing of a will and, in many states, they cannot be getting any benefits under the will. It's easier to understand the need to make a will when you know what happens when a person does. The property does not immediately and miraculously transfer its ownership to the person you name in the will as beneficiary. Instead, most wills have to go through a court-supervised process of wrapping up the estate. This process usually happens in probate court and is termed probate. You don't avoid probate by failing to leave a will, since intestate estates usually also go through probate. So, what is probate? What exactly happens legally when a person dies? This is how it works. Someone takes the signed will and files it with the probate court. This person can be a beneficiary to whom you entrusted a copy of the will, or it could be your attorney or your spouse. If you named an executor in your will, you likely gave that person the original will. An executor is the trusted person you select to shepherd your will through probate. If you didn't, or you don't leave a will, the court appoints someone to do the work, often a beneficiary, but not always. The executor identifies and collects assets, locates debts, notifies beneficiaries and generally takes care of all the legal requirements for probate. It may be that some assets must be sold to pay debts, since debts must also be taken care of before a distribution is made. Sometimes an inventory of the estate is required, and when the court is satisfied, the executor transfers the remaining assets to the beneficiaries according to the terms of the will. Spengler, Teo. "How Does a Will Work?" , https://legalbeagle.com/4565921-a-will-work.html. 29 October 2018.